This week, South Park aired the first episode of its 20th season, tying Gunsmoke and Law & Order for the second-longest running primetime TV series behind only The Simpsons, which has cataloged 28 seasons of its own, and is still running strong. In this timespan, the show has been awarded five primetime Emmys and it’s been nominated for another six. Its success can be attributed to creators Matt Stone and Trey Parker, who have become a comedy renaissance duo, collaborating on five movies, as well as the Tony-winning Broadway musical, The Book of Mormon. Though the humor can be crude and unabashed, it is often self-aware and ripe with relevant and thoughtful satire for which no topic is off limits. What keeps South Park so fresh is its ability to change and adapt over time. Early into its run, the show began to use current events and pop-culture references to poke fun at trending topics and societal norms. Just recently, it has evolved again. Starting in its 18th season, the show’s format began to include season-long continuity, whereas previous seasons’ episodes stood alone without much relevance between them. What’s so remarkable about this is how pertinent each episode’s topic is to the day-to-day lives of Americans as they are airing. This shouldn’t be surprising, however, since the documentary 6 Days to Air details the process in which South Park Studios goes through to create an episode every week with little prep time between each one. The opening episode of Season 20 picks up right where it left off last year. The presidential election, Caitlyn Jenner, and the rise of a new era of political correctness are all once again harped on for our amusement. In addition, the biggest recent national controversy, aside from anything relevant to the presidential nominees, fell right into the laps of Matt and Trey this week. The controversy surrounding NFL players and their choice to kneel during the national anthem was front and center for anyone tuning in on Wednesday night. It’s funny to consider that at the height of this divisive topic, South Park swoops in to mock its ever-growing absurdity. The buck doesn’t stop there, though. In a way that only South Park can achieve, every topic that they hit on, no matter how irrelevant they are to one another, are all tied together neatly into a fully cohesive plot. So, whether the subject is cyber bullying, disrespecting our country’s anthem or whether we should vote for a “giant douche” over a “turd sandwich,” there is a central theme behind it all. That theme is: Wasn’t everything a lot better than it is now? Early in the episode, in an attempt to quell the debate over what could be done about players choosing to sit for the anthem, a group of citizens implore J.J. Abrams to reboot it. Just like the new Star Wars and Star Trek movies, Abrams delivered without altering much, but creating a feeling of reminiscence for all. On top of all this, the episode includes talking grapes called Member Berries that bring up great bits of nostalgia, spouting off lines like, “Remember Chewbacca?” before becoming political and voicing stuff like, “Remember no ISIS? Remember Reagan?” The subtext clearly is that somehow these little grapes are responsible for the recent trend of flat-movie remakes and the rise of staunch conservatism. 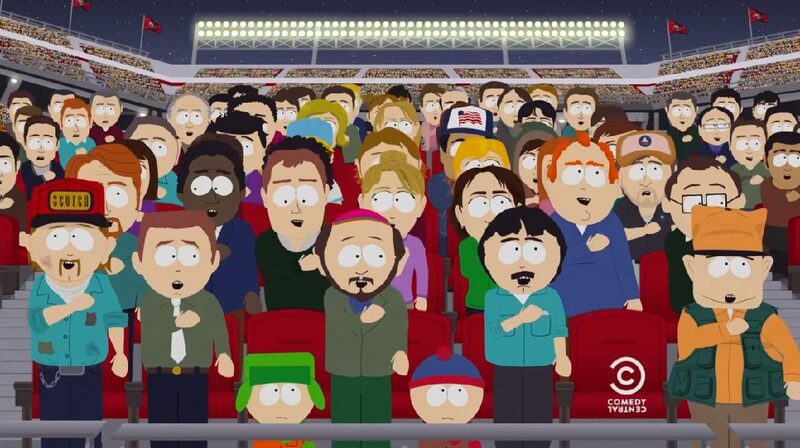 The little twists like these, which catch audiences off guard, are good examples of how South Park doesn’t discriminate on what it lampoons. At one point or another, South Park has offended just about everyone, but its penchant for irreverence just shows that it doesn’t take things too seriously and neither should we. While uptight individuals may find disdain in its content, the rest of us realize that it’s OK to laugh at ourselves every once in a while. For those of us who have been lifelong fans of the show, we’ve been doing it for 19 seasons and look forward to the next one with eagerness.